Traveling with a dog is a bit different from traveling with only humans. When a dog is going on the trip, you have to plan ahead. You need to know which hotels will allow your dog in the room. How much extra will it cost? Are there size/breed restrictions? Is there a designated potty path for dog guests? There are more hotels that allow small dogs than ones which allow large dogs. Small is usually defined as any dog under 20 pounds. If you are traveling with a large dog, or even a medium one, you will probably need to search harder for an accommodating hotel. If your dog is one of the breeds that often face discrimination, it may be even harder. When you travel with a restricted breed, you need to be aware of local laws for every place you travel through. You don't want your dog confiscated. All size dogs require you to pack some basics. vehicle restraint - I ride in a car seat with my harness clipped to the seat belt. pet first aid kit - Best to be prepared, and then hope you never actually have to use it. harness - Not all dogs have their leash clipped to a collar; some use harnesses instead. That's just the basic necessities, travel by plane, boat, train, etc has another whole set of rules you need to research and plan for. There are even more rules if you are traveling internationally. Some destinations require up to a year of planning. Are you still planning to travel with your dog? Of course you are! I don't like to travel. I think I'll stay at the DogGone Boarding House! Good tips sweetie. M had a cat once that had to go from Florida to WIsconsin to Kansas and back to Wisconsin. He actually did quite well - that was the days before carriers tho so he could ride in the back window and survey his kingdon. Great tips, Pepper! We love to travel, but we only go by car. Most hotels where we can stay do require that we bring a crate to sleep in, so we do. But we prefer the pawrents' bed, so mommy always brings a big sheet to cover the bed with. One place we stay even provides that! She also brings baby wipes to make sure our footsies are clean befure we go in the room! She brings a roll of paper towels and cleaner/deodorizer, too, in case anyfur has an accident. Pepper whenever mommy took me to Kentucky she had copies of my shots from the vet and a crate along with a plastic cool whip container one held my dog food the other held some of our water that I am used to drinking. She hooked my harness to my car seat. She had poop bags to pick up my doo doo and a nerve pill for my car sickness. (I am sorry if this already posted, but didn't say if it did. 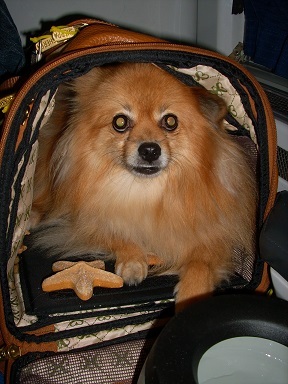 Once your peep's get your traveling kit together...traveling can be a breeze and loads of wagging fun. Being a tad over the 20 lb limit...limits me on how I travel. My peep will not put me in the hold unless she really, really has no other choice. However here in Europe its easy to go via train or car. Wow I will try to follow those really good tips, but im not sure about my dog and flying. im just confused about the security. I know the weight limit is 20 pounds or less but im still confused and worried about the security issue any suggestions? Arrive an hour earlier than you would if you were going without a dog. You or may not need to remove your dog from the bag. You may or may not need to remove the hardware (leash, harness, collar) for the metal detector/x-ray. You may have to hold your dog for the x-ray. Try to use a collar/harness/leash with as little metal as possible (plastic ID tags if you can find them). They may use a wipe on your dog, so practice with a wipe at home so she won't be scared. I don't exactly know because I am a service dog, so the procedures may be a little different. It may be best to call the airport and ask them what the security process is for a pet, then you will have a better idea of what to expect. Basically, do whatever they ask you to do. It is a good idea to practice with other people holding and inspecting your dog so he/she won't be nervous. If your dog goes to a groomer, it is probably already used to being handled by other people. Sherpa makes several great bags that meet airline specifications. They are soft, so they can be made to fit under the seat. Walk your dog before you go through security, there usually isn't any grass once you pass security. 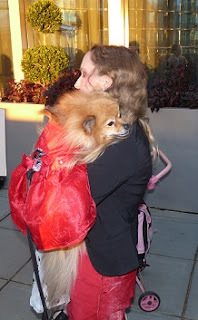 If your dog is pad trained, pack some with plastic bags to put the used ones in. An anxiety wrap is a good idea if your dog is nervous, or has never flown. Buy bottled water after security, you can't bring it with you before that point. Don't give your dog too much drink after security though. I hope all this helps. BOL! !